The Science Editor website is provided as a public service to the Council of Science Editors (CSE) community. The information and services published on this website may include inaccuracies, omissions, or errors for which CSE shall not be responsible. 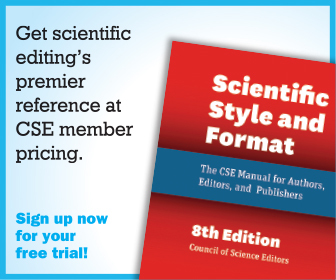 Every reasonable effort shall be made by the Editorial Board of Science Editor, CSE, its Board of Directors, and Committee members to provide accurate, up-to-date information. 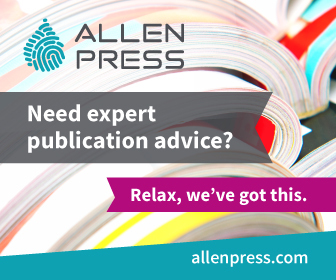 Opinions expressed by authors contributing to this publication are those of the authors and do not necessarily reflect the opinions or policies of CSE or the Editorial Board of Science Editor. Science Editor will not knowingly accept advertisements that are deceptive, misleading, or expressly incompatible with our mission and goals. 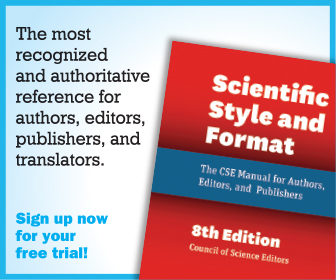 Science Editor does not endorse, advocate, or guarantee any offer, viewpoint, or representation made by advertisers in Science Editor. 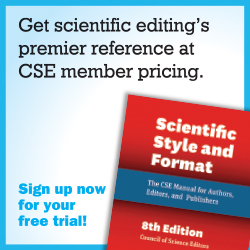 Neither the Editorial Board of Science Editor, CSE, its Board of Directors nor its members shall be held responsible for any special, consequential, or exemplary damages resulting, in whole or in part, from any user(s)’ use of or reliance upon this website’s contents. By using the information contained herein, the user willingly assumes all risks in connection with such use including but not limited to verifying the accuracy, completeness, currency, and suitability of such information. CSE may make improvements and/or changes to this website. We welcome suggestions for such additions, omissions and/or other changes. CSE reserves the right to refuse to post any information on its website at any time. Any advertisements or services stated herein are not endorsed or approved by the Editorial Board of Science Editor, CSE, its members, funders, sponsors nor any of the organizations shown. 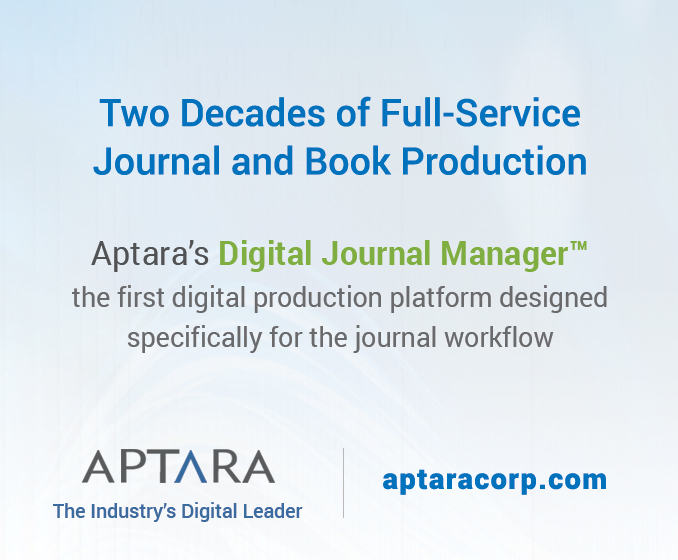 Links to other websites are provided for convenience only. No endorsement of any third party website, services or information is expressed or implied by any information, material or content referred to, included on, or linked from or to this website.